Relax daily after a long and exhausting day at the work. If you sit for long periods of time each day working on a computer, you may be at risk for developing soreness in the neck, shoulders, arms, back, thighs. Stretching of the back and legs can help maintain or improve movement for everyday functions. Include the stretching exercises in your routine to improve a faulty posture. Do you wake up and feel that your body is so knotted and stiff, that affects not only you but others around you? Morning stiffness is very common. Creating a routine in each morning to stretch is important for more than just peace of mind and increase flexibility. First thing in the morning, by stretching, you will improve your brain activity, decrease body aches and pains, and increase your energy level throughout the day. Including some stretching in your daily morning routine can help energize you for the day. How can our Yoga Strap helps you? The older we get, the less elastic we are! Stretching exercises improves significantly the muscular elasticity, making the muscles younger Stretching exercises play the role of restoring muscle freedom that they once had. The free e-Book offers you a multitude of exercises that can help you increase your mobility and elasticity. Our Strap for Yoga will help you achieve gradual stretching exercises simple and easy to accomplish without a partner. Modify, adapt and adjust the stretching movement to fit your particular needs. After only 10-15 minutes of stretching you can calm down your mind and offer your body the opportunity to recharge. The exercise booklet has been developed for you, giving you a multitude of stretching exercises with detailed instructions and photos for each position. The Strap Exercise is non-elastic for perfect resistance. The superior nylon quality ensures greater durability. Our Yoga Stretch Strap with neoprene handle prevents injury during exercise. Easy to carry thanks to the carry bag included in the package. We will support you throughout your process by giving you the most professional stretching exercises to improve your health and mood. Bring more stretch – Our stretching strap is recommended for both athletes and sports amateurs who want to prepare their muscles for sustained physical effort and for those with mobility problems who spend a lot of time in the office. Stretching is recommended by physical therapists that are passionate about fitness, but also by kinesiotherapists, in case of mobility problems. Recovery muscle injuries - Our therapy strap is beneficial for stretching exercises that affect the tendons or ligaments, mainly aiming for the muscles. Reducing muscle soreness after exercise is a cornerstone of enhancing recovery. Muscle tension and soreness are removed by stretching. Find Your Balance – By exercising stretching we achieve a lot of positive effects on the body and soul, self-control and self-improvement. 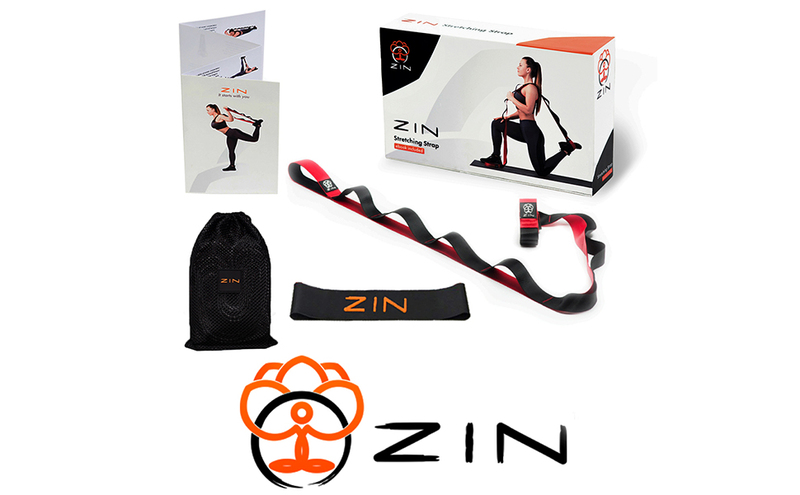 Improve your yoga poses and Pilates exercises with Zin Stretching Strap. Multi-Loops allow gradual exercises and obtaining deeper poses no matter if you are a beginner or advanced. It is suitable for people who practice ballet, dancing, running. How can our stretching strap helps you? Great product to use in our homes or anywhere, saves time and money! It was more than I expected, helped me a lot in what I wanted to achieve with my body! It can be used in multiple ways at any time any hour. My physical therapist recommended me to do more stretch and physical exercise after a knee surgery. This product helped me a lot in my recovery. I strongly recommend! Great product! Is exactly as in the description. The handles are very soft due to the neoprene padded, and the material is very qualitative. I use this strap at home every day after work.